If you wish to invest on one of the best camera unit for your action photography then GoPro Hero5 Black will be best option for you. It consists of some of the best features that serve with amazing results for video recording as well as stills. GoPro Hero5 Black is advanced version of Hero4 Black with added stabilization feature and improved resolution so that users can enjoy immersive recording on the go. It comes with touch screen display and is designed with classic waterproof material so that people can easily use it even for snorkelling or other under water applications. Useful voice controls, improved audio capabilities, image stabilization and its GPS enabled controls make it one of the best selection in professional range. The price range for GoPro Hero5 Black is $399 and it can be ordered from Amazon for prime delivery. You will definitely enjoy its 4K/30fps resolution recording that serves like breathtaking impression with impressive audio quality. Experts use to recommend this device for RAW photography needs as well as for capturing memories during trekking, snorkelling, cycling and other adventure sports activities. 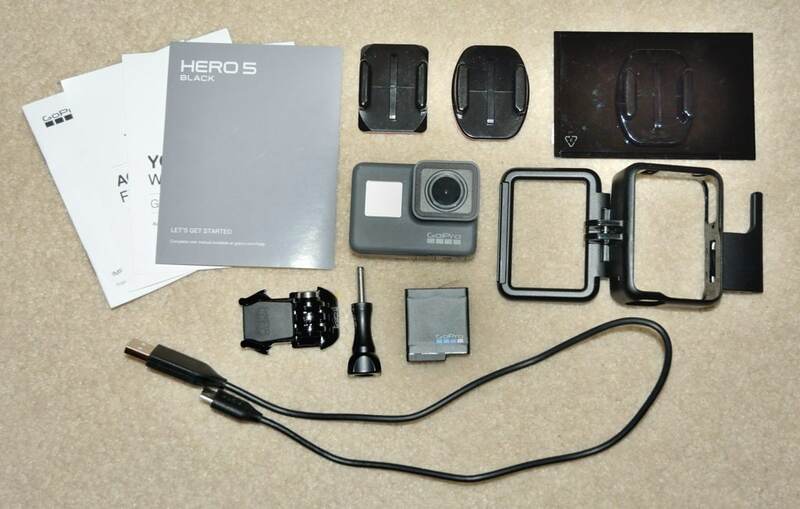 The box includes your GoPro Hero5 Black Camera unit, mounting buckle, black frame, curved and flat adhesive mounts, rechargeable battery and USB-C cable. Looping, Burst, Protune, Auto Low Light, Night Lapse mode and Night Photo Mode. Voice control, GPS, Bluetooth, WIFI. Mounting buckle and black frame. Curved and flat adhesive mounts. You will get all these things with a payment of $399. The Hero5 Black model is little modified as compared to Hero4 cam as now its rectangular shape is coated with grippy material and corners are rounded up to enhance beauty of product. Simply saying, GoPro Hero5 Black features a new attractive design with little bigger size. You will be glad to know that GoPro Hero5 Black comes with water resistant body up to 33feet/10meters so it is ideal choice for diving needs. It consists of a 2 inch LCD type touch screen that makes it much easier to operate even for beginners, whereas on the other side its three-microphone system picks the best sounds from your world. But the sad part is that it does not follow voice commands for turning GPS on or off so that battery can be saved. The GoPro Hero5 Black camera unit comes with overdue type video stabilization feature for 4k recording whereas new linear mode of this device allows users to have better results with lesser barrel distortion. One can use it with GPS tagged locations for all RAW and WDR photos. Professionals love to capture immersive natural beauty with its wide angled focus that leads to much better video quality. Other than this, you will love to enjoy its unique modes with added functionalities so that you need not to edit your videos after completion. You can join GoPro Plus services with payment of $5/month only; with this facility it becomes much easier to share, edit and upload your clips. All your videos and photos can be easily transferred to phone as well as computer within few minutes and this GoPro plus service also provides access to licensed music library where you can save your collections. Quick is the editing application which can be used on iOS as well as Android devices and it helps to analyse all video clips in much efficient manner so that the best collections can be extracted. It helps users to add creative effects and transitions to video clips as well as one can sync the audio files easily to generate impressive beats for recorded videos. The desktop version of Quick also contains all these features and can serve users with extended control functions, like enabling users to overlay the GPS data for extreme analysis of speed, G-force and other data fields. After watching all these features we can say that Hero5 Black is one of the most powerful devices in GoPro Hero series with enhanced capabilities. It is appreciated for wide dynamic range, huge shooting options, removable battery, impressive voice controls, water resistant body, GPS, advanced stabilization and voice command features. If you are searching for a new camera unit to get best recordings on your tours then it is good to order your GoPro Hero5 from its official website or online shop like Amazon. Once this product will reach your door step then soon you will be able to record breathtaking videos and they can be easily uploaded on social media platforms.